Thank you for being our guests at the Joint Conference. We wish all of you Merry Christmas and a Happy New Year! Conference booklet now available online. Acceptance/rejection notifications for PhD workshop out. Springer Gabler and Pearson to act as exhibitors. Early bird registration period was extended. BBBank eG to host get-together. Registration and submission system now open. Lubos Pastor academic keynote speaker. 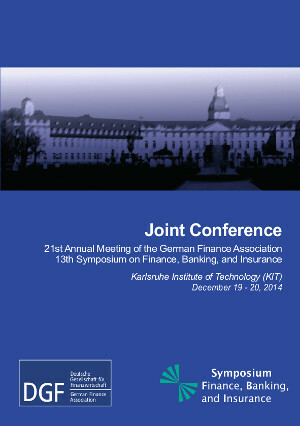 Karlsruhe Institute of Technology (KIT), December 19 and 20, 2014.
empirical research from all areas of finance, banking, and insurance. The conference booklet is now available. Please click on the picture to view or download the PDF file. Manfred Meier-Preschany (†) · Frankfurt a. M.
Jörg Franke · Frankfurt a. M. Andreas Sauer · Frankfurt a. M.
Wolf-Rüdiger Heilmann · Berlin Ulrich Walter · Frankfurt a. M.